The long cold winter is now only a memory, thank goodness. The Met Office has announced today that May was the hottest May on record for over 100 years, and the fishing has been fabulous despite the swing in temperatures. There has been a marked increase in the numbers of anglers enjoying great sport at The Fishery during May, which I’m sure is a reflection of the weather. Almost back to the good old days. Together with Corporate days every week during the month. Often bagging 60 or 70 fish during the day. The staff have had a busy time. We don’t have a catch “limit” on Corporate days, and so we frequently see large numbers of fish caught. It’s been a good month. For those of you who like statistics, we rear 15,000 fish each year, and apart from a few monsters, which we hold back we are in a simple three year cycle. Because we stock 4lb plus we do have mortalities during the year, but the vast majority of the fry grow on to be stocked for angling. Unlike many other still water Fisheries, we have one third of the River Itchen flowing through our lakes, so from time to time you might well catch a smaller wild fish. But if you do catch a fish of less than 4lbs (pre gutting) keep it, but don’t count it towards your bag. Can’t be fairer than that. Despite one of our contributors saying that hearing that most people were bagging up was not good news for him, I am pleased to relate that the vast majority of anglers did catch their bag, and only a very few blanked. Occasionally both fishing the same lake on the same day. It is important to note that not everyone fills their bag on every occasion. Technique must be in question, the willingness of a fish to take a fly on a given day, your personal pheromones, etc., But if you are struggling to get into a fish, talk to Aaron or Roger or James, and they will be happy to help with constructive comment on tackle, flies, technique, retrieval etc. There are some very large, but clearly very elusive fish in all lakes, with any number of sightings, but very few successfully landing double figure fish. There was a time when we had anglers who only caught double figure fish, and would occasionally blank because of their slavish stalking of one particular monster. but sadly most have now passed away. Rest assured the fish are still in the waters as they have always been, but they tend to be in for considerably longer than they once were. This year we have seen a large number of first time visitors, who are delighted with 4lb’ers and thrilled with 7 and 8lb’ers. But who have not yet grown into big fish anglers, or learned the skills of stalking. But nonetheless recognise the quality of our full finned, full tailed, fighting fish. 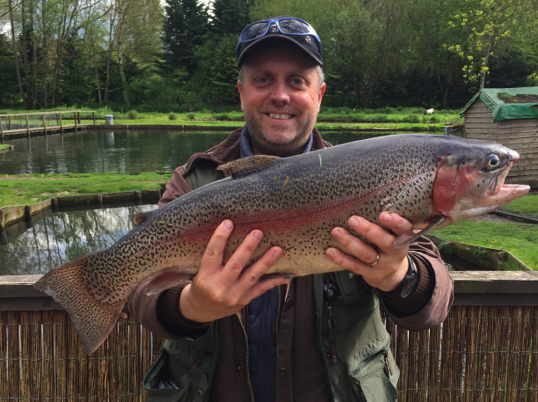 A specimen Rainbow of 11lb was landed by Barry Williamson, with Paul catching a 7lb fish, Clarke also 7lb. Kev 7.5lb and Jackson Jones a 7.5lb and a 7lb. Colin Beddow 7lb 14 oz. Ant 7lb 7lb., 7lb 14oz and 8.25 lb all in one bag. The May fly rise has been significant this year, although slow to begin with, as I write (3rd June 2018) are now in large numbers. Some of the trout caught in the last week were (unusual for Avington) risers, looking for a spent May fly (spinner) on the surface. The carrier of course enjoys plenty of activity during the May Fly month, and has not disappointed this year. For many years I spent May on Lough Derg in Eire. We would have huge fun catching the mayfly which we kept in specially made boxes, before baiting the hook, some times “dapping” but often casting traditionally, into the Lock. Fantastic fun, but not always productive in terms of fish caught. Finally, you may remember the beautiful photograph of the Goldcrest taken by Dr. Townsend during a visit to Avington several months ago. 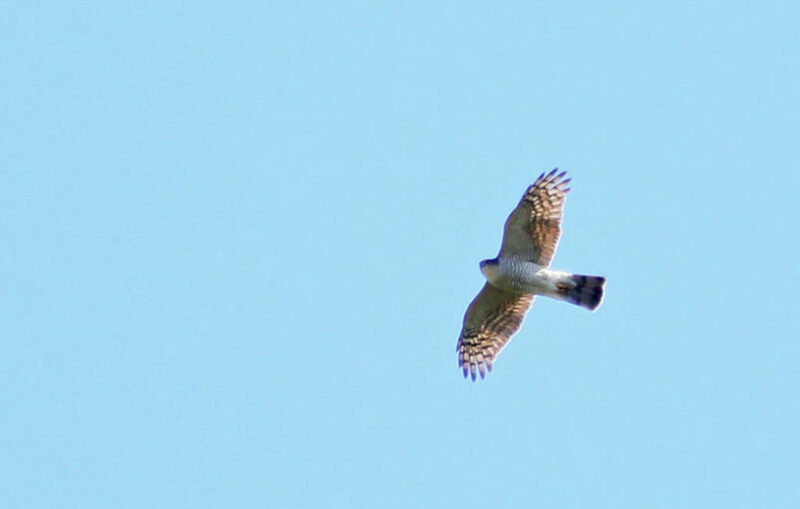 Dr. Townsend returned at the beginning of May, and whilst fishing looked up and managed to take this beautiful shot of a male Goshawk soaring, in the sky above the lakes. It really pays to look around, even if you are here for the sole purpose of fishing.